We are nearing a crucial inflection point in the worldwide bubble finance cycle that has been underway for more than two decades. To wit, the world’s central banks have finally run out of dry powder. They will be unable to stop the credit implosion which must inexorably follow the false boom. We will get to the Fed’s upcoming once in a lifetime shift to raising rates below, but first it is crucial to sketch the global macroeconomic context. In a word, we are now entering an epic deflation. 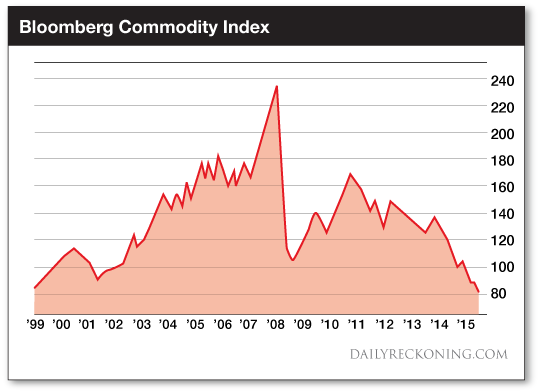 Its leading edge is manifested in the renewed carnage in the commodity pits. This week the Bloomberg commodity index, which encompasses everything from crude oil to soybeans, copper, nickel, cotton and livestock, plunged below 80 for the first time since 1999. It is now down nearly 70% from its all-time high on the eve of the financial crisis, and 55% from its 2011 recovery high. Wall Street bulls and Keynesian apologists for the Fed want you to believe that there isn’t much to see here. They claim it’s just a temporary oil glut and some CapEx over-exuberance in the metals and mining industry. But their assurances that in a year or so current excess supplies of copper, crude, iron ore and other commodities will be absorbed by an expanding global economy couldn’t be farther from the truth. In fact, this error is at the heart of my investment viewpoint. 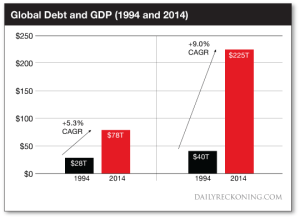 We believe the global economy is vastly bloated with debt-based spending that can’t be sustained. And that this distortion is compounded on the supply side by an incredible surplus of excess production capacity. As well as wasteful malinvestments that were enabled by dirt cheap central bank credit. Consequently, the world economy is actually going to shrink for the first time since the 1930s. That’s because the plunging price of commodities is only a prelude to what will amount to a worldwide CapEx depression — the kind of thing that has not happened since the 1930s. There has been so much over-investment in energy, mining, materials processing, manufacturing and warehousing that nothing new will be built for years to come. The boom of the last two decades essentially stole output from many years into the future. So there will be a severe curtailment in the production of mining and construction equipment, oilfield drilling rigs, heavy trucks and rail cars, bulk carriers and containerships, materials handling machinery and warehouse rigging, machine tools and chemical processing equipment and much, much more. The crucial point, however, is that sharp curtailment of the capital goods industries has far more destructive implications for the macro-economy than a reduction in consumer appliance sales or restaurant and bar tabs. Service operations have virtually no working inventories and the supply chains for durable consumer goods such as dishwashers and cars typically have perhaps 50 to 100 days of stocks on hand. So when excessive inventory investments accumulate, the destocking and resulting supply chain curtailments are relatively short-lived. But when it comes to capital goods the relevant inventory measure is capacity in place. That’s where the bubble finance policies of the Fed and other central banks have done so much damage. Prolonged periods of below market capital costs induce business customers to drastically over-estimate investment returns. And therefore to eventually accumulate years and years worth of excess capacity. This is very different than your grandfather’s consumer goods recessions of the 1950s and 1960s. Those typically involved moderate production cutbacks and several quarters of inventory destocking. But this time the capital goods adjustment will take years, perhaps more than a decade. When iron ore mines are drastically overbuilt, for example, new orders for Caterpillars’ (CAT) big yellow mining machines can drop to nearly zero. That’s why CAT is already in the longest string of dealer sales declines — 35 straight months and running — in its 100 year history. That’s also why the coming global recession will be so prolonged and stubborn. When cheap credit generates a boom in long-lived and expensive capital goods, it gives rise to a pipeline of new capacity. This pipeline is not easy to shut-off and often makes sense to complete — say containerships, steel plants or new field mines — even if pricing and profitability have already headed south. That’s known as the sunk cost problem. Mining equipment orders are likely to remain deeply depressed for the rest of the decade. And this syndrome will be repeated in most other sectors such as heavy trucks, shipyards, oil drilling equipment etc. This depression in the capital goods industries, in turn, means the disappearance of thousands of typically high pay, high skill jobs at companies like Caterpillar. The same will happen among their extensive chains of outsourced components, materials and service suppliers. And the cascade of those contractions down the economy’s food chain will further intensify and extend the deflationary dynamic. 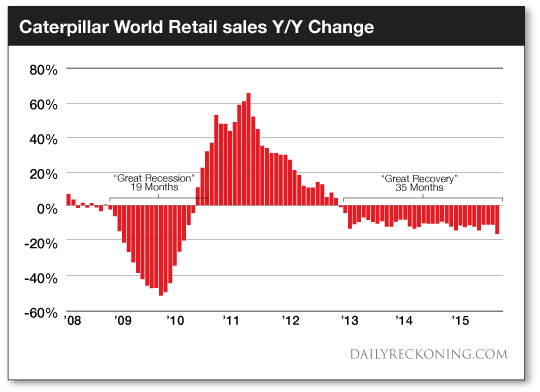 The graph below give some hint of the massive downturn which lies ahead on a worldwide basis. 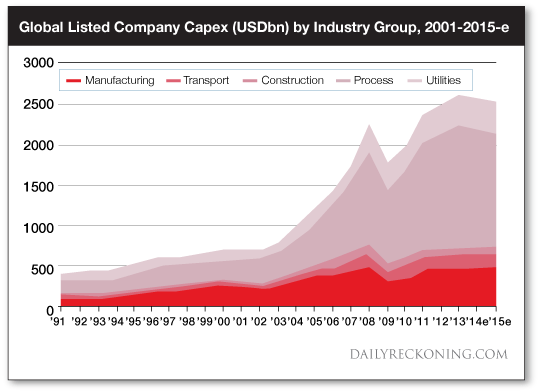 During the last 25 years CapEx spending by the publicly listed companies of the world grew by an incredible 500%. Much of this happened in China and the Emerging Market (EM) economies, and in the transportation and distribution infrastructure that connects them. Yet this massive explosion of investment spending didn’t happen because several billion Asian peasants suddenly decided to save-up a storm of new capital. Instead, this unprecedented construction and CapEx campaign was financed almost entirely by a massive issuance of printing press credit at virtually zero real interest rates. That means capital was drastically underpriced and that waste, excess and inefficiency abounded. At length, the global economy became dangerously unbalanced. And these adverse consequences of the false central bank credit boom, in fact, highlight the investment opportunity ahead. Healthy capitalist investment based on market prices and savings set aside from current income can go on indefinitely, fueling rising efficiency, output and wealth. But CapEx based on printing press credit only temporarily enabled the world economy to have its cake and eat it, too. Now it’s payback time. Yet the laws of sound finance and market economics never change. It often just takes an extended time for all the excesses to work their way through the system and finally reach the blow-off stage. The graph below summarizes this great deformation. Over the last two decades, global credit market debt outstanding has soared from $40 trillion to $225 trillion. This represents an incredible $185 trillion debt expansion. That eruption would be simply unimaginable without the help of money printing central banks. By contrast, global GDP only expanded by $50 billion during the same period, and even that’s an overstatement. Much of that reported gain merely represented the one-time pass-through of fiat credit, not real savings put to work in efficient production. Consequently, it is likely that the global economy accumulated more than $4 of new debt for every $1 of incremental GDP. Not only is that self-evidently an unsustainable financial equation, it also means that when credit growth stops, the bottom will drop out of reported GDP. It wasn’t new wealth in the first place, just production stolen from the future. And this gets us to the Fed’s upcoming move to raise interest rates for the first time in 10 years. It will amount to a sea-change that in due course will shatter the entire regime of bubble finance that gave rise to the false credit and CapEx boom depicted above. As I have often said, the Fed has become addicted to the “Easy Button.” During more than 80% of the 300+ months during the last quarter century it has either cut rates or left them unchanged. Accordingly, the professional gamblers in today’s Wall Street casino have no real experience of a time when the “Fed is your friend” adage failed to work. They have experienced essentially false one-way markets, knowing that the Greenspan/Bernanke/Yellen “put” under stocks and other risks assets would come to the rescue. But here’s the thing. After 84 months of zero interest rates — and folks that’s pure lunacy by all historic standards — the Fed has run out of time and excuses. If it doesn’t begin to normalize rates at last, and as repeatedly promised, its credibility will be shattered. And what it long has been deathly afraid of will happen. That is, the market will plunge into a hissy fit that will shatter confidence in what is essentially a giant credit-based Ponzi. And the other major central banks of the world are in the same boat. Just last week we saw the ECB stopped short by its powerful Germany contingent that essentially said to Draghi that $1.3 trillion of money printing is enough. Likewise, the People’s Bank of China (PBOC) has run out of dry powder, too. And that’s of monumental importance. The epicenter of the global commodity, industrial and CapEx boom was in China. Thanks to the greatest money printing spree by the PBOC in recorded history, outstanding public and private debt there has exploded from $500 billion in 1994 to $30 trillion at present. That’s a 60-fold gain. Is it any wonder that the commodity and CapEx charts shown above went nearly vertical during the peak of the global boom? But now China is facing the collapse of its credit Ponzi, and capital is fleeing the country at a prodigious pace. In the last 15 months alone, nearly $1 trillion has high tailed it for London, New York, Australia, Vancouver and other resting places for flight capital. So the PBOC is being forced to stop its printing presses in order to prevent the Yuan exchange rate from collapsing and the capital outflow from getting totally out of hand. Even in Japan, the Bank of Japan’s printing press is no longer accelerating. That because notwithstanding trillions of new money conjured from thin air during recent years, Japan is on the verge of its 5th recession in seven years. Even in Japan, bubble finance is losing its credibility.